This isn’t going to become a regular thing, but I’m getting into the swing of things for the year, planning costumes for conventions and outfits for pageants (I’ve just sent my application in for what might be the first for 2015!) and photoshoots. Part of what comes with that is a shopping list. And, because I’m determined not to have a repeat of the frantic, expensive and excessive shopping trip I had in the lead up to Cooly Rocks On, I’m making lists. Lists are important because they help me to budget. They also help me not to shop blindly and get dazzled by shiny things (I am possibly part magpie and this happens often) and they help to work out how long you’ve got to look, which means whether I have time to wait on international shipping, or if I can try and sew something myself. I have loved this dress since I first saw it. I missed out on it in the Black Friday sales (it was all I wanted) so now I’m committing myself to buying it THE SECOND it comes back. (Please, let it come back). I can wear this so many different places! Seriously, was there ever a more perfect evening gown for a red head? I have plans for this lady. Not the least of which is to bring a little glamour into those Saturday nights I spend on the couch. *** I am holding out on this one for a bit though because I’m convinced I might be able to get a pale blue real vintage nightie for less than $100, which this one will cost to ship from the UK. Look at the colour! I have a bit of a thing for sequined dresses and this one is beautiful. Another one for all those glam parties I’m being invited to. This one is probably going to stay on the wishlist on account of the fact it’s been out of stock for a while. And now the shoes. My physio has banned me from my obsession with cheap (but cute) flat shoes. You know the kind I mean? The ones that are always reduced to $5 and start to stink after about four wears and fall apart in a couple of months? The ones that sneakily mean you’re spending more money on shoes than if you’d just forked out for decent ones in the first place? So I’m moving on to mid-height heels, particularly lace ups and strappy shoes so they’re practical for shopping, walking around on the weekend, etc. Which brings me to my current major footwear love, B.A.I.T Footwear. 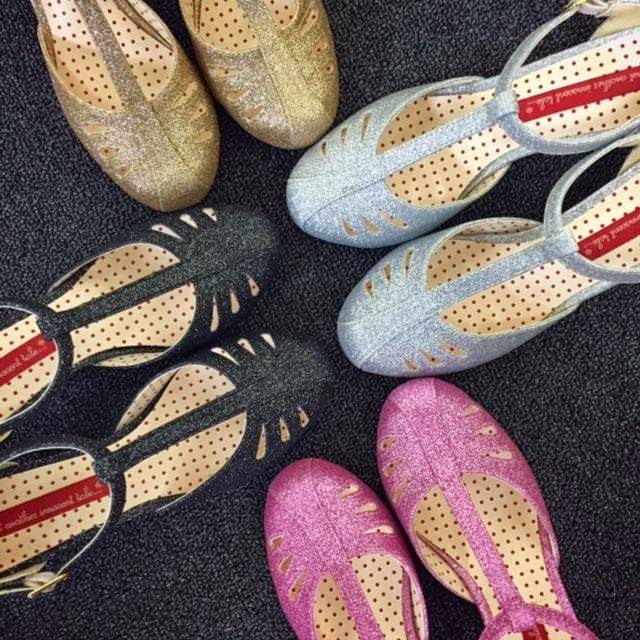 Their shoes are so cute, comfy and affordable and they go with my vintage clothes! Picture from B.A.I.T Footwear’s FB page. Dennise: in yellow. And also celery (but I they’re sold out in my size). I feel like these would work well as a casual shoe, but they’re also dressy enough that I could wear to work during summer without looking like I’ve come from the beach. Desi: in, again, all of the colours. For the Aussie girls, Desi is one of the B.A.I.T lines that Kitten D’Amour is now stocking and with the Aussie dollar not really sitting equivalent with the USD any more, they’re cheaper than what you will pay direct from Kitten (that’s where I’ll be getting mine). Kitten D’amour’s shoes can be found by clicking here. I’m going to finish by saying that this is just my wishlist. Before anyone says something about my shopping habits; I haven’t bought anything off my last list (they’re all still there). But listing them out is a really good way of working out if I really need them. Or waiting until there are sales!! *My actual thought process in the week before the Michael Jackson “Thriller Live” show. **There’s pretty much .01% of a chance I’ll be invited to a black tie event this year. Disclaimer: While I do have affiliate links on this blog, I have not been paid for this post and I will not earn commission on any purchases made via links from this post.